Can Tho (VNA) – The museum of the Mekong Delta city of Can Tho and the Vietnam News Agency (VNA) on August 8 jointly held a photo exhibition to celebrate the 50th founding anniversary of the Association of Southeast Asian Nations (ASEAN). The exhibition, which will run until September 30, features 120 photos introducing the establishment and development of the association, along with the socio-economic achievements as well as national cultural identity of Vietnam in the ASEAN community. Via the lens of VNA reporters, important events throughout ASEAN’s five-decade development are highlighted, including the first ASEAN Environment Forum in Hanoi in September 1999, the opening of the Conference of ASEAN Ministers Responsible for Information in October 2000 in Hanoi and the 34th ASEAN Foreign Ministers’ Meeting in Hanoi in July 2001. Director of the Can Tho Department of Culture, Sports and Tourism Tran Viet Phuong said that the event is part of activities to celebrate the 50th anniversary of ASEAN and 72 years of the August Revolution (August 19), and the National Day (September 2). 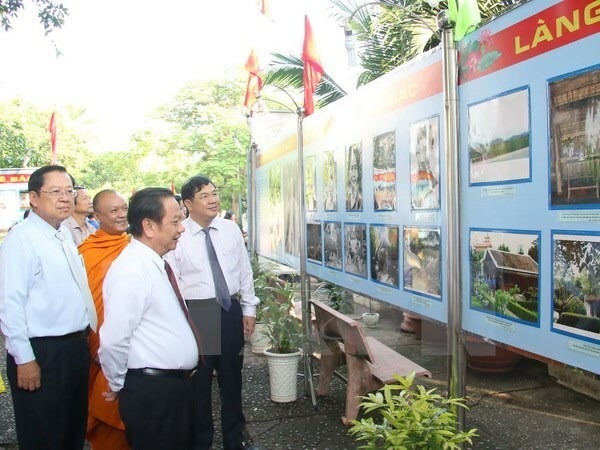 Also on August 8, Can Tho also launched another photo exhibition themed “Sen village – Uncle Ho’s Homeland” showcasing 120 photos on the place where President Ho Chi Minh was born and grew up, as well as the late leader’s visits to his homeland.